Hello, readers! We apologize for being away from the blog this weekend. We were at a family wedding and just returned. Hope you enjoy this photo of the early Christmas celebration that Jill, Derick, and Israel Dillard had with Derick's family. 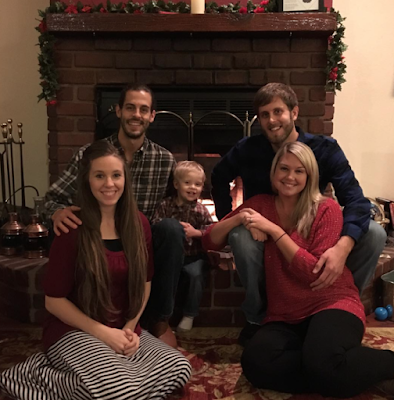 Derick only has one brother, Dan, so compared to the Duggars' holiday gatherings, get-togethers with the Dillards are quite a bit less crowded. Dan married Deena on November 12th, so this is their first Christmas as a married couple. Beautiful family. Derick and Jill both have very nice families and nice to see none of them are ever excluded. So the Dillards are staying in the states and not going back to CA? I hope they do stay in the states. There is so much opportunity to be missionaries on American soil too! Why isn't the obvious being posted.....When are Jill and Derick returning to Central America? They have already overstayed their own statements about this time they intended to be here. Let's get some information out about this. I think if Lily and Ellie had that information, they would post it here. I don't think they are hiding anything. I always thought they would stay until Christmas was over. I am sure they will announce something if they don't leave in January. Regina - you are right. The Dillard's are choosing not to share that information. It's reasonable to ask. Especially considering they are actively soliciting donations. I have a feeling Derick might be the reason they haven't gone back yet. His health, I mean. Anon@6:55 I guess if you're donating to their mission fund, you have every right to ask questions and expect some updates on how your money is being used. For the life of me, I cannot understand why anyone would send them money. I hope Dan doesn't have to have (or elect to have) the jaw surgery his brother had. Derick is still looking rough after his. Anyone with a little knowledge of medicine should be able to surmise what could be wrong, just by looking at his frame. I thought it looked very nice after it began to really heal. So cute. The Dillard's are still in America? Deena is very pretty and her and Dan make a wonderful couple! Hope they have a long and happy life together! Also hope they, as well as Jill and Derick, have a MERRY CHRISTMAS and a HAPPY NEW YEAR! I also hope for Jill's sake, that the new year finds her and Derick staying right here in the good ol' U.S.A.!! Nice family photo. Merry Christmas to all. Happy and Blessed 2017. Why did Derick have to have jaw surgery, I don't get it. How old is Israel, now, and are Jill and Derick expecting again?!!?!!?!!? I missed Grandma Kathy (Dillard). Is she doing okay? SS yes He does. I get the feeling you must sincerely be seeking question about God and the Bible because I noticed you were asking about God on another post. First of all please do not listen to replies that will say there is no God, the Bible isn't true, etc. It says in John 3:16 "For God so loved the world, He sent His only begotten Son, that whosoever shall believe in Him shall not perish but have everlasting life." God loves you as well as all the people who comment here. He sent Jesus to die on the cross for our sins. You will get lots of wise counsel here from godly sisters and brothers here so please listen to them. If you would like to study more about the gospel there is a correspondence course available through Lamp and Light Publishers. Their mailing address is 26 Road 5577, Farmington,NM,87401.If you need to talk to someone then I recommend the ministry I'm involved in through Christian Aid Ministries. It's a prayer line through our Billboard ministry. That number is 1-(855)FOR-TRUTH. There someone can talk to you more in depth and can(with your permission) send you gospel literature. I hope I have helped in some way. I will pray for you. Absolutely! The Bible tells us that "God so loved the world that He sent His only begotten Son that whosoever believeth in Him shall not perish, but have everlasting life!" (The Bible also tells us that every human is a sinner, which is why Jesus came to earth to pay the eternal punishment for our sin). @7:50 AM -- Yes. He loves EVERYONE on earth, even the worst of the worst. Read your Bible and pray and ask him to reveal himself to you. He WILL. Ask His son Jesus into your heart and life. Seek out a local Protestant church -- Baptist churches are in most cities. If you don't have a Bible, I'm sure a church will give you one if you ask. Ask a pastor for guidance and prayer, and start attending a Bible-preaching church. I will pray for you. God loves you! !